The youngest son of an alcoholic former boxer returns home, where he’s trained by his father for competition in a mixed martial arts tournament - a path that puts the fighter on a collision corner with his older brother. BEFORE: I’m taking a break from the advanced screenings today, don’t worry, they’ll be more next week. 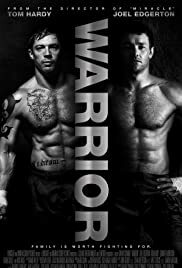 Today will feature the rising Tom Hardy and the old Nick Nolte in Warrior. AFTER: To be honest, I’m not a huge fan of the whole fighting genre. Every once and a while there’s one that I enjoy like Rocky or The Fighter, both of which focus more on the characters and their stories rather than the fighting. Warrior is different in that it takes a dual-approach. The beginning focuses a lot on the Conlon’s: Tommy (Tom Hardy), Brendan (Joel Edgerton), and the father (Nick Nolte). You get to know and understand a little bit about this distant family. The problem is; it’s boring. I couldn’t connect with these characters and there wasn’t much reason for me to invest. Then everything changes when Sparta, the big mixed martial arts tournament, begins. Surprisingly, I got more emotion and a greater connection with the characters when they were mute and beating each other to bloody pulps than I did when everyone was peacefully talking with one another. I have to take a moment to recognize Nick Nolte’s performance as the recovering alcoholic father. He does such an amazing job start to finish as you see him struggle with what has and is happening to his family. Nolte was nominated for the Best Supporting Actor Oscar but lost to Christopher Plummer. I’ll have to reserve judgement until I see Plummer’s performance but Nolte did a real standup job. Overall, Warrior is a tossup. The beginning was hard to watch, especially the multi-pane montage scene. Think 24-style only nowhere near as effective or well done. Compare that to the wonderful second half and it’s hard to come up with an overall score. But since I have to, I’m going with a 4/5 just because the final act is that good..